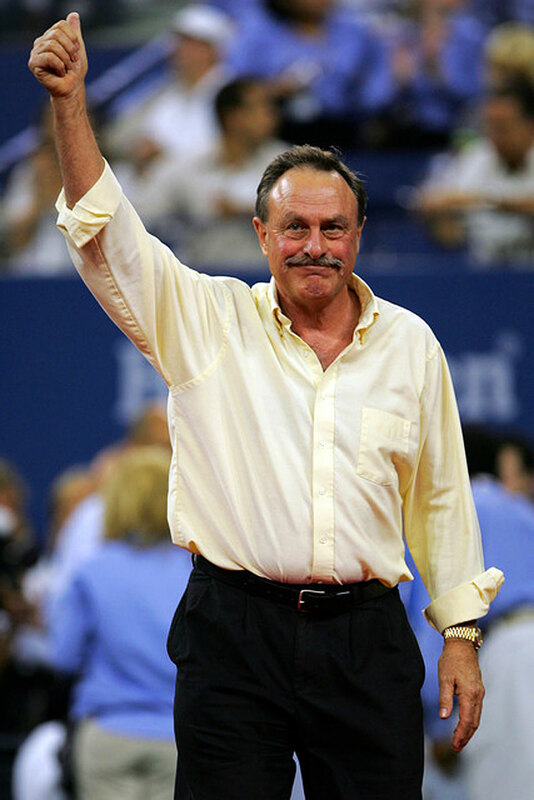 John Newcombe is an Australian tennis superstar who dominated the tennis game from the early 1960s through the 1970s. He won 8 Grand Slam singles titles, and overall he won 26 Grand Slam major titles. Essentially, he was the Roger Federer of his time. To date Roger Federer holds the record for Grand Slam titles at 17, but his are all Men's Singles Titles. 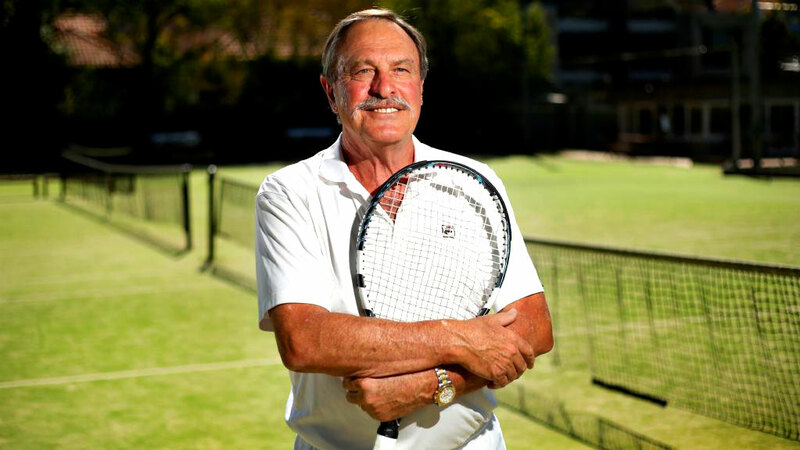 John Newcombe holds 26, which include 8 Men's Single Titles, with the rest being Double's Titles, or Mixed Doubles. If you include his 1965 Mixed Doubles shared with his count would be 27 Grand Slam Titles. He holds the record to this day for the maximum number of Grand Slam Titles. This first Tiffany & Company Rolex Day-Date ad is from 1975. "In an age of instant obsolescence, the classic Rolex endures." 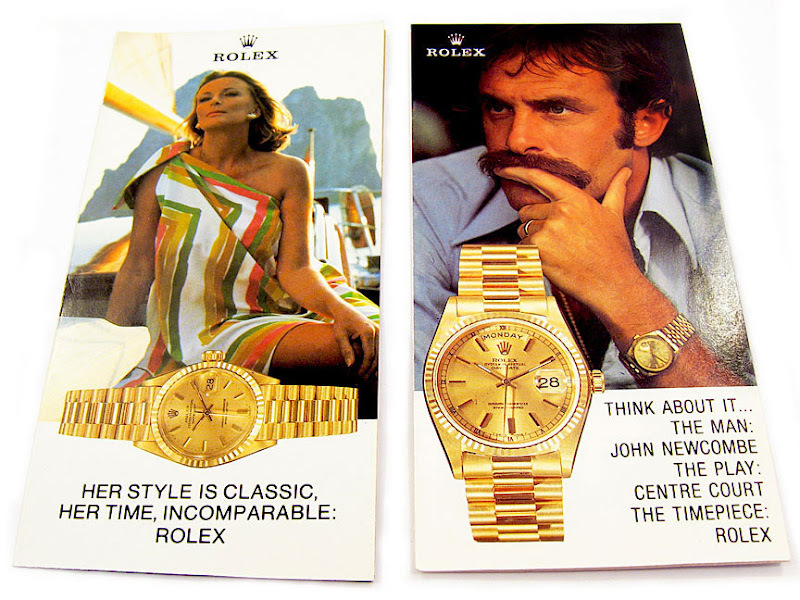 This next Rolex Ad is also from 1975 and it is from Rolex's photo in the watch series which was fun. You also have to love the Rolex statement about how Rolex watches transcend obsolescence. 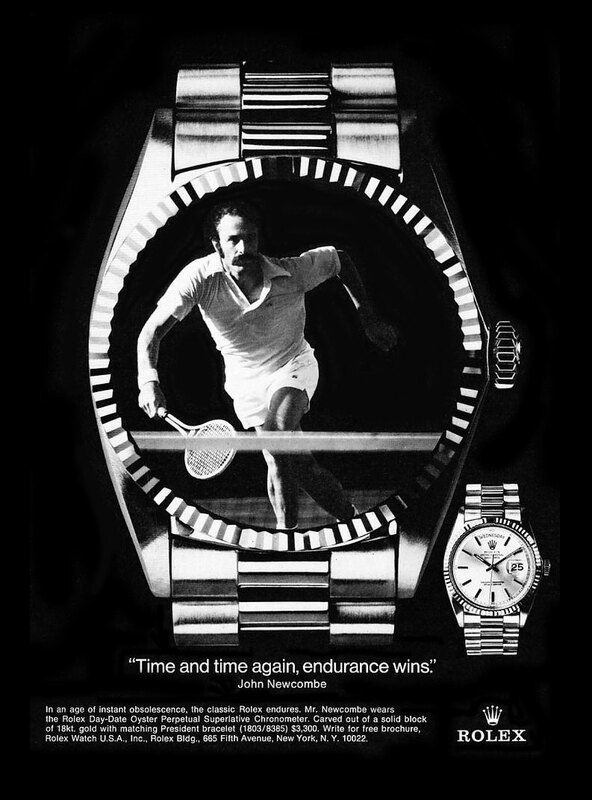 As we look 41 years back at this Rolex ad, we realize this statement was absolutely true!!! 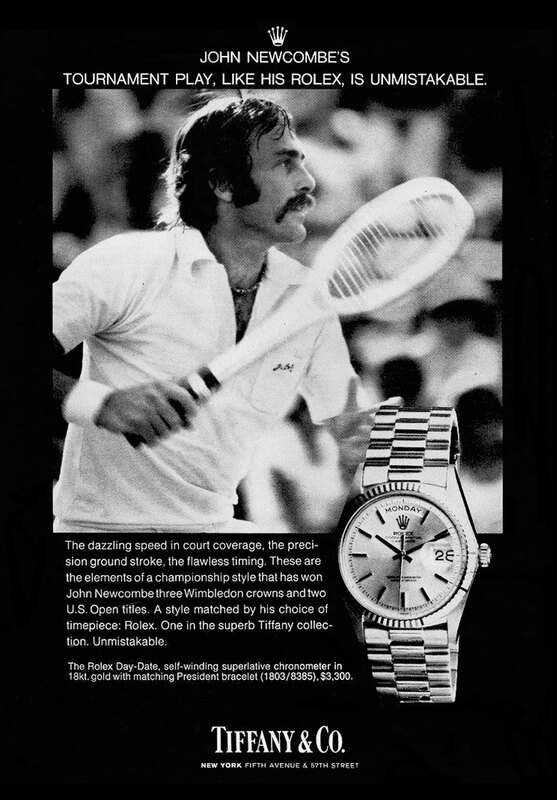 This next image below on the right shows John Newcombe on the right featured in a Rolex brochure from the 1970s. 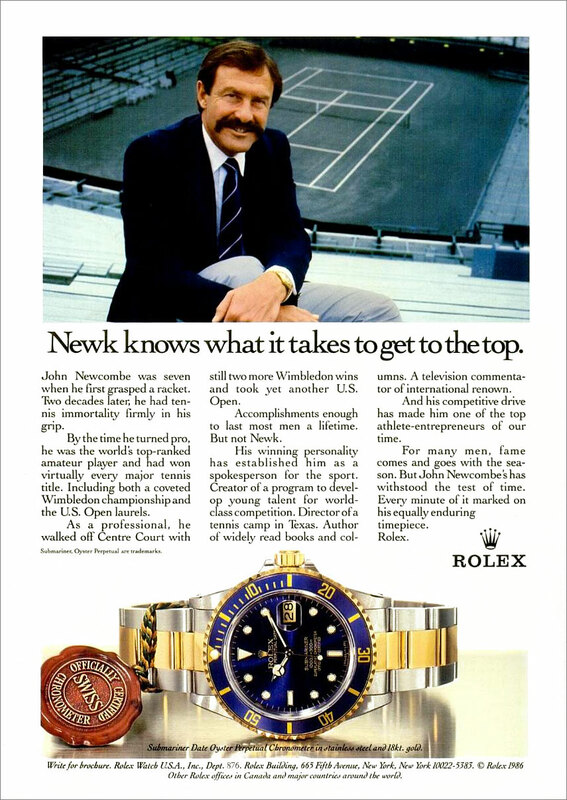 This next John Newcombe ad below is from 1986, after John retired, and it refers to him by his nickname of Newk. 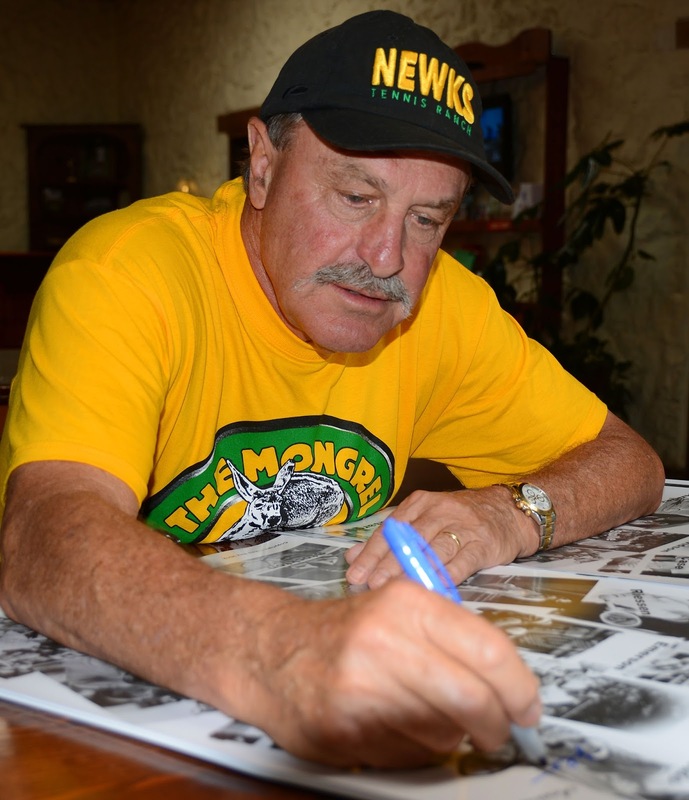 This next images are recent photos of John Newcombe and he is still wearing his Rolex watches which he has been wearing for at least 41 years!! !